Jade Property Suite 6 is probably one of the best real estate software available in the market which allows real estate property agents to easily keep track and manage their property listings with ability to automatically print real estate brochures or flyers, save to PDF format for easy sending by email, and create HTML files of complete property listings and publish it to Internet on hosted websites for online marketing of real estate, an essential step to bring in more clients – buyer and seller. 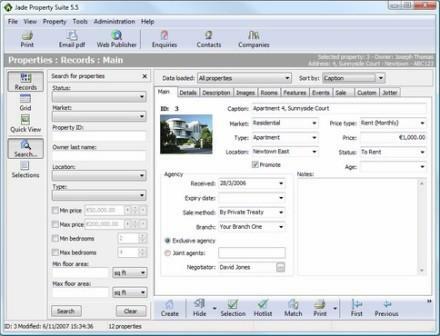 Jade Property Suite 6 saves all agency listings and contacts in a database that is easy to update, search, match, print, export and web publish. With a database, it has added advantage of can be used with a standalone local database or with a shared database in a multi-agent office. Web Publish real estate listings with a directory of categorized listings, a property search engine and property details pages with ability to select which properties to publish on web. Print real estate marketing materials or output to PDF with ready-made, editable full-color templates for generating flyers, brochures, catalogs, window cards, reports, letters and envelopes, or business cards and labels. Generate emails and send them with own favorite Windows email application. Match potential buyers to properties. Track the activity and progress of real estate sales. Ability to customize the templates, menus and filters. Support multiple agents share the same database. Jade Property Suite 6 used to have a price tag of USD $429 or EUR € 299 for a single license for one computer. With the release of Jade Property Suite version 6, the popular and best real estate property management software has been made to license free of charge to new and existing customers, in a bid to we encourage our existing users to get up-to-date by upgrading from Jade Property Suite versions 3 and 4, and promote the software to more agencies and agents. There is no need to enter registration details, and can be installed on as many computers as users wish (including computers that share the database). There is no obligation to upgrade later too.